Flamborough Head looking north west towards Filey. The drama started way back on Friday morning as I sat in my office in Birmingham. The 'mega-alert' wailed away on my pager to inform me that a CRAG MARTIN had been located as it zipped around the clifftops at Flamborough Head in East Yorkshire. Unfortunately I was away when the previous 'twitchable' bird was found at Swithland Reservoir in Leicestershire, just up the road from where I live, nearly fifteen years ago to the day. I had more or less accepted that I would never see this species in Britain as long I was alive, bearing in mind all of the previous records had been brief encounters of a hirundine that never lingers. As more positive messages filtered through I started to get decidedly nervous. I sat there trying my hardest to concentrate on my work but it was no use, I had no alternative but to try for the bird today. Once again my very empathetic boss granted me permission to leave the office early and by midday I was back home picking up my optical equipment. A quick glance of the pager showed that the bird was still there and I was now hastily making my way north as fast as the 50mph speed restrictions on the M1 motorway would allow! Then whilst speeding along the M62 disaster struck. The heart breaking message that all keen birders dread, cruelly appeared on the pager. There had been no further sign of the bird for nearly a hour, when it had made a brief appearance around South Landing. I took the decision to pull into a lay-by near the village of Holme-on-Spalding-Moor and bide my time. There was little point in continuing my journey for another hour if the bird had departed. After a quick nap I decided to grab my binoculars and do a bit of sky-watching from the car. A number of species were spotted passing over the bland, cereal monoculture of the locality including a Red Kite, a male Peregrine and several Common Buzzard, one of which had me jumping from the car in panic at one stage as it mimicked a distant Rough-legged Buzzard, easily the most 'strung' species in Britain today. With no further sign of the CRAG MARTIN by 4.00pm I decided to cut my losses and head back home before the motorways became too congested. Needless to say I was pretty disappointed but I had a gut feeling that this would not be the last we would hear of this particular cliff-dwelling, little critter. I remained hopeful that the bird would appear elsewhere in Britain at some stage during the weekend. Saturday morning was spent birding locally around Middleton Lakes RSPB with Nadia as we searched for spring migrants. Our first Common Tern of the year was spotted along with a few passage waders including 3 Curlew and 20 Dunlin. Numbers of both Ringed Plover and Little Ringed Plover had increased from the previous week and the adult Mediterranean Gull was joined by another second-summer individual. There was no sign of any Yellow Wagtails but 2 White Wagtails put in a brief appearance. The air was full of birdsong with male Blackcap well into double figures and the odd Chiffchaff and Willow Warbler holding territory. I also heard my first Lesser Whitethroat of the year around Fisher's Mill Bridge. Nearby, a couple of Yellow Wagtails were located amongst a small flock of Pied Wagtails at Kingsbury Mill. After a hard morning and early afternoon out in the field it was time to put my feet up and relax during the latter part of the afternoon. That is until the inevitable happened. At around 2.40pm, the sound of the 'mega-alert' reverberated around the living room. I knew what it would be, even without looking at my pager. Amazingly, the CRAG MARTIN was still in the Flamborough Head area, this time at Thornwick Bay. I briefly considered making the journey there and then, however sense soon prevailed. I grabbed my loppers from the shed and took out my frustrations on an overgrown elder tree in the corner of the back garden instead. Whilst grafting away, regular updates were continually received, the last one of which stated the bird was still present around North Landing up until 7.20pm. This was pretty good news as far as I was concerned, there was a chance that it could have roosted in one of the many small caves or on the sheltered cliffs around North Landing. A quick check of the weather forecast for Sunday stated that it would be a bright, clear day with a brisk south-westerly breeze up in the north east. This was a major concern as these were pretty perfect conditions for a migrating hirundine to take advantage of. If it did roost overnight the CRAG MARTIN may not linger for long once it had warmed up and fed for a while. An early start was imperative. I managed to convince Jules Allen, Dave Hutton and Steve Richards to be at my home in North Warwickshire for 4.30am sharp. It was a risk making the journey but I did not want to take any chances hanging around the West Midlands until positive news came through. In any case there are far worst places to be than Flamborough Head if you are going to dip, especially at this time of the year. The mood in the car remained pretty up beat, then when we were about thirty minutes away from our destination Steve made an excited announcement... it was still there! The atmosphere in the car changed from positive and relaxed to very tense indeed. We should have set off earlier! Early morning at Flamborough Head. Just before 7.00am we pulled into a fairly quiet and bitterly cold car park at North Landing. The first impressions were far from great. The body language of those birders in attendance did not suggest that a major rarity was in their midst. All you keen rarity chasers out there will know exactly what I mean, I call it the 'no show shuffle'. It is a despondent little dance that any new arrival to a twitch site does not want to witness. 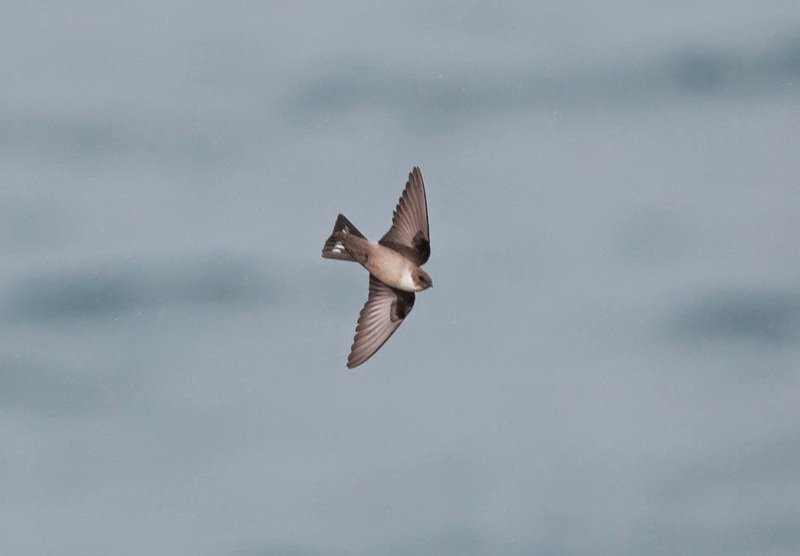 We eventually found out from a shivering Martin Garner that the CRAG MARTIN had showed briefly and somewhat distantly out in the bay before disappearing south-east behind the headland. To make matters worse that was nearly half a hour ago. As we sheltered behind the cafe from the biting winds, Lee Evans received a call from one his disciples informing him that a TAWNY PIPIT had been relocated just around the headland at Breil Nook. With the main attraction not on show most folks trundled off to have a glance at the increasingly rare Anthus. We were on our own until reinforcements arrived. A plan of action was put into place to carefully walk the cliff tops and scour the many ravines in search of the rarity. From my experience of the species in Europe they often feed beneath the cliffs and with the strength of the wind increasing it may have been using the high stacks of chalk as shelter. We were not too long into our search when I spotted the dark profile of a hirundine silhouetted against the early morning sunshine. It was certainly no Swallow and it looked too bulky for a Sand Martin. That brief view for no more than two seconds was enough to send my heart racing. I yelled to rest of the guys and urged them across to the next ravine. 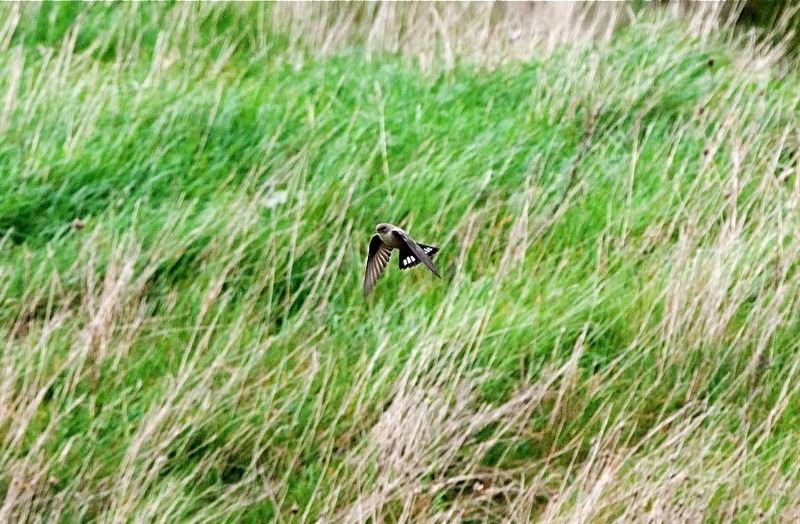 A shout then went up from Dave, against all the odds we had relocated the CRAG MARTIN. The Flamborough Head CRAG MARTIN. The bird then provided just six of us with our very own performance as it wheeled around just feet away. At one stage it even perched up on a sandy bank towards the top of the cliff before continuing to feed. After another few minutes of stunning views the bird then gained height and flew directly towards the lighthouse. As we celebrated I completely forgot that we were all perched precariously hundreds of feet above the sea and I almost knocked Steve off his feet. Sending Snapper hurtling towards a watery grave would definitely have taken the shine off such a memorable occasion. 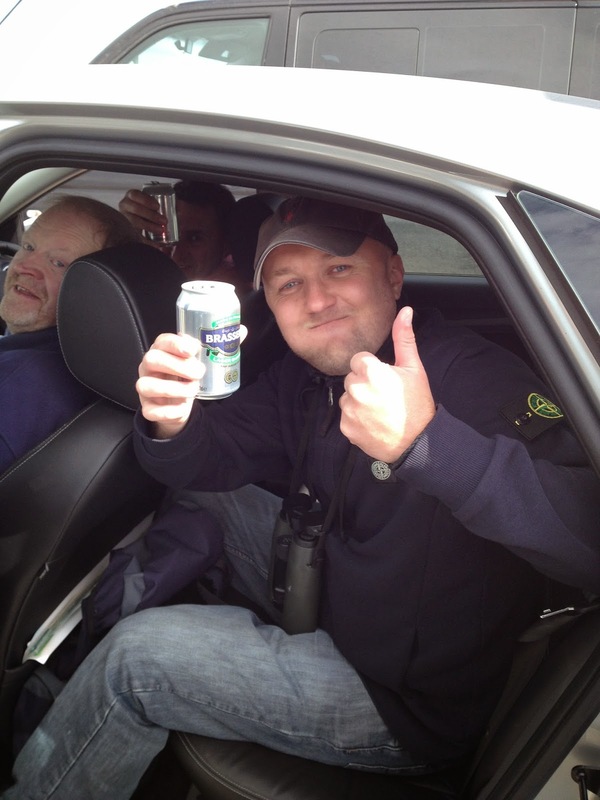 The only photo of a perched up CRAG MARTIN in Britain. With the pressure now off we headed in the direction of the lighthouse to see if we could find the bird again. As we made our way around past Breil Nook Steve picked up on the distinctive call of a large pipit. Suddenly there in front of us was our second rarity of the morning, a fantastic TAWNY PIPIT. The bird showed well for a while perched up on a fence post before being chased off into the long grass by a Meadow Pipit. TAWNY PIPIT at Flamborough Head. 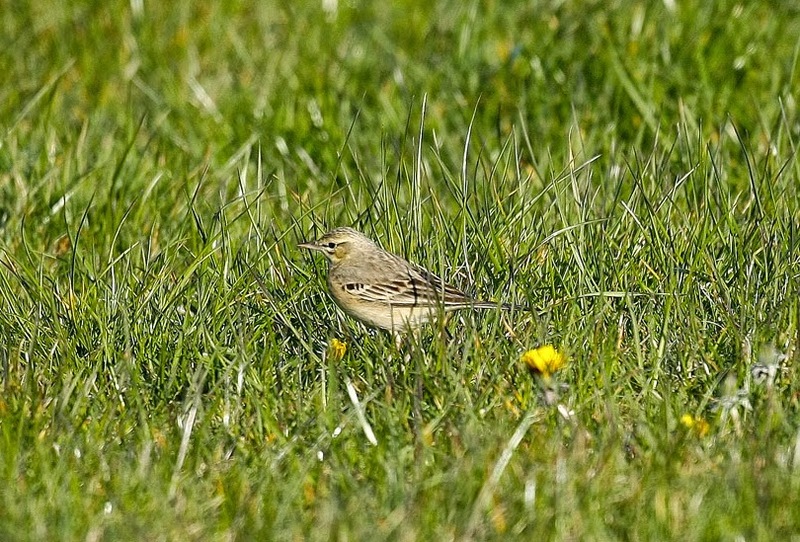 With no further sign of the CRAG MARTIN we decided to head back to North Landing where we encountered the TAWNY PIPIT once again as it fed in a grassy field close to the footpath. 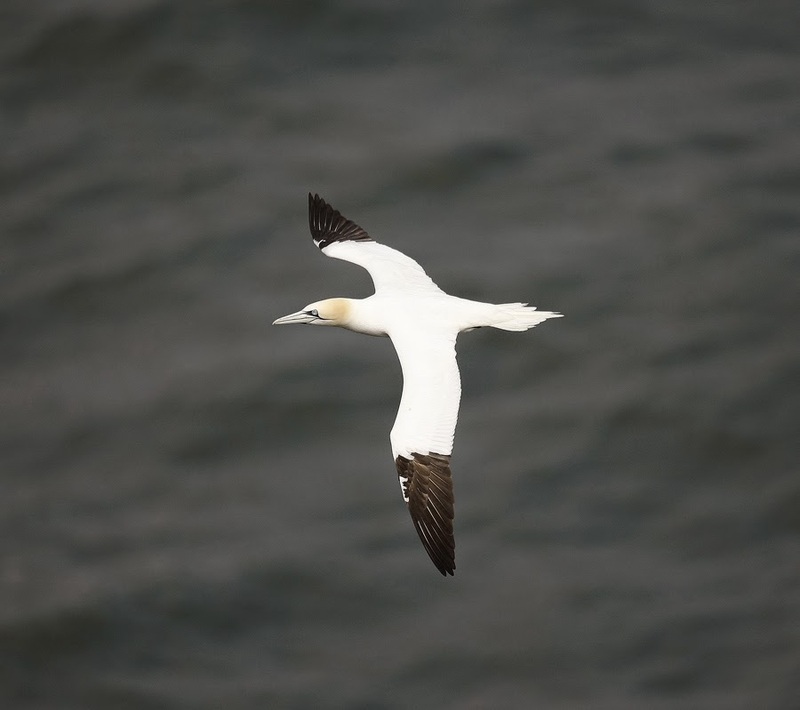 A scan of the bay resulted in hundreds of Gannets and Kittiwakes streaming past as well as small flocks of both Razorbill and Guillemot heading up to their breeding colonies at nearby Bempton. Just a trio of Puffin were located bobbing around on the water along with the odd Shag or two. Flyovers included a single Yellow Wagtail and a pair of Corn Bunting. We then took a stroll around to Thornwick Bay where we encountered a few Northern Wheatear along the cliff tops and 4 Sand Martin in the bay itself. Once again there was no sign of their rarer cousin. We then drove around to the Lighthouse area but there was nothing of note other than a load of singing Skylark and the odd Meadow Pipit. Snapper Richards celebrates with a can of shandy! A spray-tanned Dave Hutton & a dishevelled Jules Allen celebrate! The Eurasian Crag Martin, to give the species its proper name breeds in the mountain ranges and around the cliff faces of north-west Africa and the Iberian peninsula northwards to southern Germany and east through the Mediterranean region and into central Asia. The populations of southern Europe are mostly resident however the Asian populations are migratory. 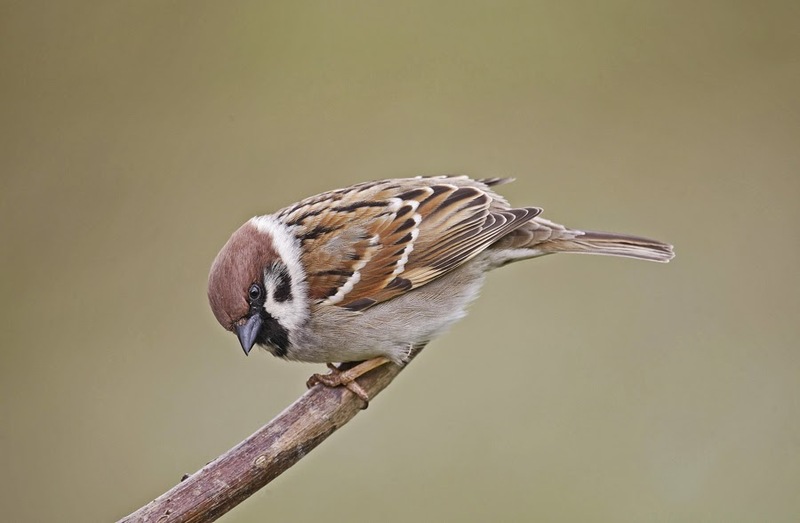 These birds spend the winter in north-east Africa and north-west India across to north-central China. 2008 - Sussex - Truleigh Hill, Upper Beeding - 21st September only. 2006 - Surrey - Badshot Lea - 22nd October only. 1999 - Orkney - Davey's Brig, Finstown, Mainland - 3rd May only. 1999 - Yorkshire - Pugney's and Angler's Country Parks, Wakefield - 18th April only (presumably same as the Leicestershire bird). 1999 - Leicestershire - Swithland Reservoir - 17th April only. 1995 - Sussex - Beachy Head - 8th October only. 1989 - Gwynedd - Llanfairfechan - 3rd September only. 1988 - Sussex - Beachy Head - 9th July only. 1988 - Cornwall - Stithians Reservoir - 22nd June only. 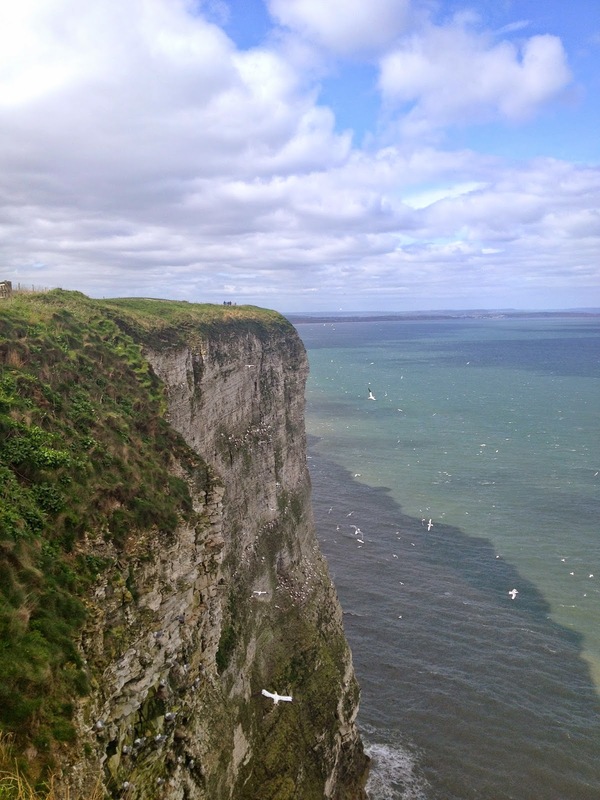 We then made our way around to Bempton RSPB reserve for some close up seabird action. The usual Gannet, Kittiwake and Fulmar all provided us with some superb views, as well as some interesting smells. There is nothing like a seabird colony to leave a lasting effect of on your senses, the one connected to my nose however is something I could do without. The impressive seabird colony of Bempton RSPB. A Gannet drifts close by at Bempton RSPB. Although not yet in evidence in great numbers around the cliff ledges there were some sizeable rafts of Razorbill and Guillemot down on the sea. Remarkably though only a single Puffin was located flying around below the cliffs. We then made our way back to the visitor centre where around 35 Tree Sparrows showed well around the feeding station along with the odd Brambling or two. It was a pleasant, relaxing end to a superb day up in Yorkshire and yet another successful twitch at Flamborough Head. 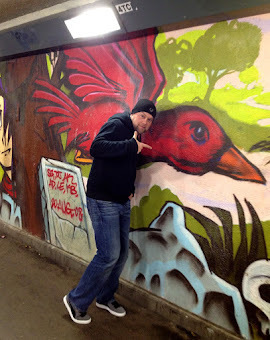 Unfortunately though the day did not go quite as well for a few of our birding brethren. Those who arrived after 8.00am would not have caught even the briefest glimpse of the CRAG MARTIN. I really hope they do not have to wait another fifteen years like I did. One of the many friendly Tree Sparrow at Bempton RSPB. Heading back along the A614 just after Driffield, a Red Kite graced us with its presence as it glided across the road just a few metres above the car. Around twelve hours after we had left the Midlands for our adventure, I was back home safely. With the adrenaline still pumping though I could not resist a quick trip down to my local patch. Down at Alvecote Pools I spotted my first Common Sandpiper of the year and a couple of male Lesser Whitethroat were in full song. A superb day in every way! Special thanks to Dave Hutton, Mike Morse and Martin Standley for the use of their excellent photos.